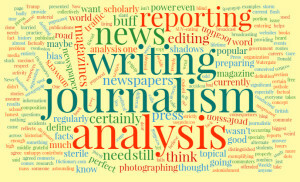 a course of study preparing students for careers in reporting, writing, and editing for newspapers and magazines. He calls himself a historian, but his books are mere journalism. OK, so why was I unhappy with the answers? I do agree that there are superficial publications (Weekly World News anyone?) and there are certainly superficial reporters – but let’s not define a concept with a few bad examples. Now, even if we assume that I’m offended by “superficial” because my writing certainly falls more into the “topical” than “scholarly” writing category and I don’t want people to think of me as superficial, there is still the “without analysis” issue. In a perfect world, all journalism would be strictly factual, without bias, and still provide analysis. I’m sorry, we are not all history, political, or even a current events buffs, why do I need to know these facts? Analysis connects the dots. OK, a traffic accident during commute hours does not need much analysis – it needs reporting so that other commuters know why they’re stuck or to take alternate routes. Yet, if traffic accidents are regularly occurring in a certain location, then maybe we do need some analysis. Does the road do something weird in that location? Is there an SUV-eating pothole? Are there odd shadows that cause confusion? Are there not enough shadows, and everyone is going blind in that one spot? Are zombies regularly entering the road there? I believe in and am grateful for the power of a free press (especially with what is currently going on in the US government) and a significant portion of that power comes from the analysis of the facts the press is reporting. ← Get Inspired, Damn It!